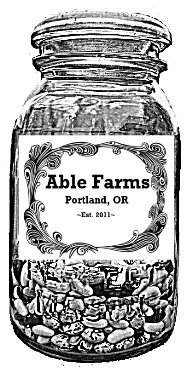 Able Farms, Inc. | Able Farms, Inc.
A small organic and free range farm in Portland, OR. We are strong. We are passionate. We are Able. Author Archives: Able Farms, Inc. 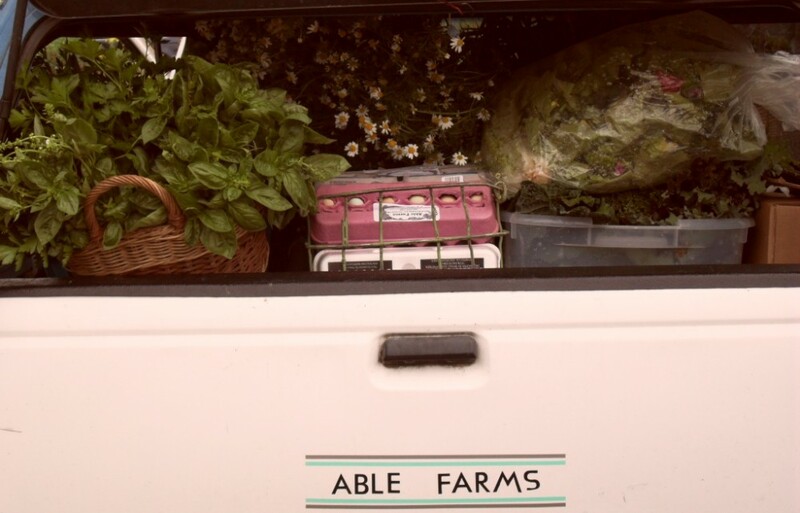 Able Farms is a small farm owned and operated by Megan Denton, Jenny Herget, and Dan Cadmus.We are located on Sauvie Island and in St. Johns. We raise free range poultry, sheep, and grow organic produce. All of our methods are sustainable and we use Scratch n' Peck feed, which is a non-GMO mill, for our animals. Our mission is to grow, educate, and share our products as well as our resources for our community. Our hope is to use our farm not only as a agricultural food source, but also as a platform for food culture and community outreach. We cater to those who celebrate the American farmer. We are all have powerful backgrounds which lend to making Able Farms a well rounded operation. We are strong. We are passionate. We are Able. 2015 CSA Shares Available Now! Posted on March 27, 2015 by Able Farms, Inc.
2015 CSA shares are available now! Shares include a variety of vegetables, fruits, a half dozen chicken eggs, and occasional farmer processed goods, such as pickles and jams. Include a whole, pastured, GMO-free chicken with your share once a month for an additional $80. For an additional $10 each week, you can add a Coffee Lover’s option and receive a special Able Farms 12oz blend of beans from Trailhead Coffee Roasters. All subscribers also receive 20% off all Able Farms events, Farm/Pop-Up dinners, workshops, holiday turkeys, and Able Farms swag! Follow us on Facebook and Instagram for regular updates! 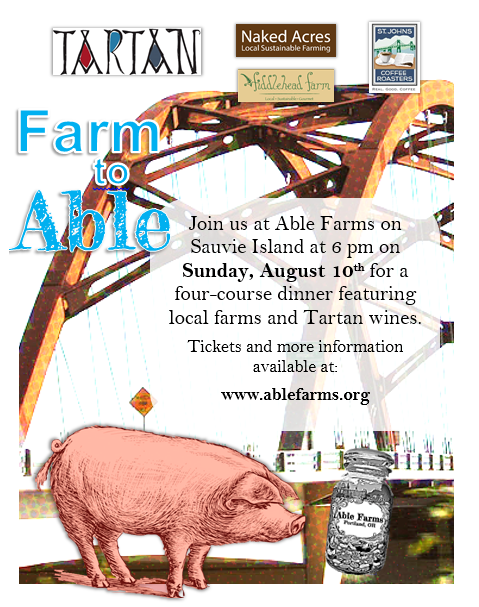 Posted on July 18, 2014 by Able Farms, Inc.
Hey y’all, our main website is currently down, but you can still use this site to buy tickets to our upcoming Farm to Boat and Farm to Able dinners! If you have any additional questions, please contact us at ablefarmspdx@gmail.com or 503-828-7674. Thanks for your patience! Tickets are $50… Click the flyer to add tickets to cart through Paypal! Tickets are $75… Click the flyer to buy tickets through Paypal! Posted on July 27, 2012 by Able Farms, Inc.
We have a new website! Please check out www.ablefarms.org for all future Able Farms updates. Thanks for your support! Late Summer/ Fall CSA shares available! Posted on July 22, 2012 by Able Farms, Inc.
It’s not too late to sign up for a CSA! Pick-ups will be every Wednesday at 9571 N Buchanan Ave at 7:30 p.m. unless otherwise arranged. Community Supported Aggriculture (or CSA) means a relationship of mutual support and commitment between you and Able Farms. With your share, you’ll receive a grocery bag full of a variety of vegetables and a half dozen eggs each week. On the first pick-up of the month you’ll also receive a whole chicken. Shares will be available until the last week of October for $330 or may be broken into monthly payments for $130 per month. Members should expect to receive a selection of beans, beets, blackberries, broccoli, carrots, collards, cucumbers, eggplant, garlic, herbs, kale, kolrhabi, lettuce, mustard greens, onions, parsley, peppers, radishes, summer squash, tomatillos, tomatoes, winter squash, and some heirloom varietals depending on seasonal production. Members are encouraged to bring their own bags or containers to transport their food. If interested, please contact us as soon as possible. 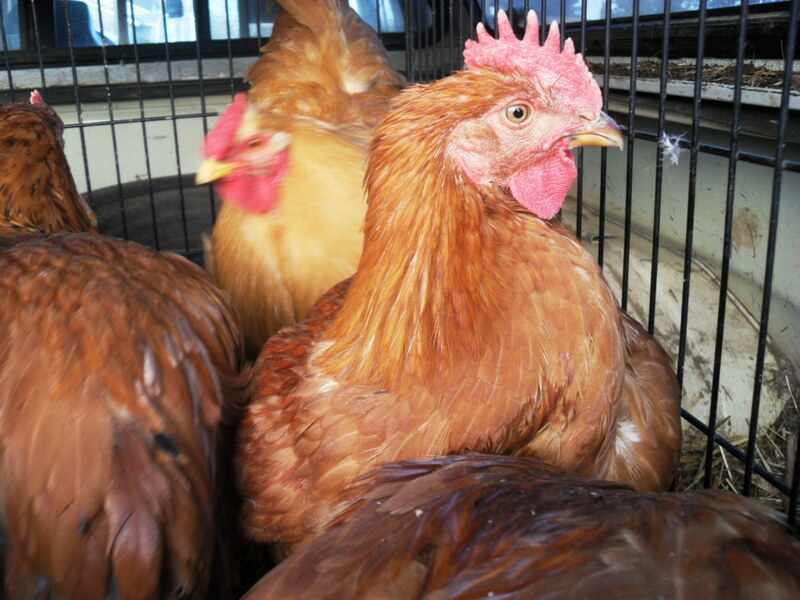 Posted on June 27, 2012 by Able Farms, Inc.
Megan Denton of Able Farms will demonstrate a humane slaughter method and basic breakdown of one of our own pastured birds. The class is limited to 3 persons and an Able chicken will be supplied for each person to slaughter. The class will cover basic history of chickens and current industry classifications and regulations. The fee for the class is $50 and class will be held at 11 a.m. on July 29th at Linnton Feed & Seed. Able Farms will provide all supplies needed for the class, except a vessel to take your fresh chicken home in. If you would like to register for the class please contact Megan @ (503)828-7458. 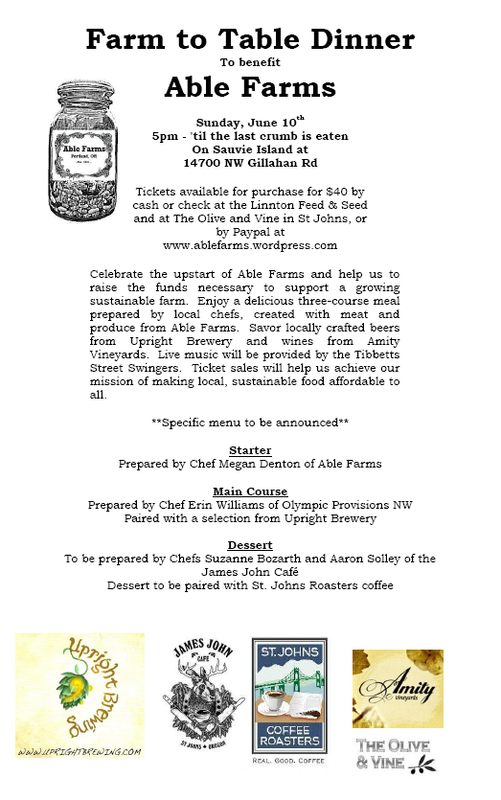 Farm to tAble Menu…THE DINNER IS SOLD OUT!!!! Posted on May 30, 2012 by Able Farms, Inc.
Posted on March 31, 2012 by Able Farms, Inc.
We’re hosting a farm-to-table style dinner on June 10th to help raise money for Able. The Linnton Feed & Seed (10920 NW Saint Helens Rd) and the Olive & Vine in St Johns (8711 N Lombard St) will have tickets available to purchase by cash or check for $40, or purchase via PayPal through the blog and you’ll be able to pick them up Will-Call on the day of the event. We’re having a three course dinner, with nearly all of the food coming directly from Able, and beer from Upright Brewing. 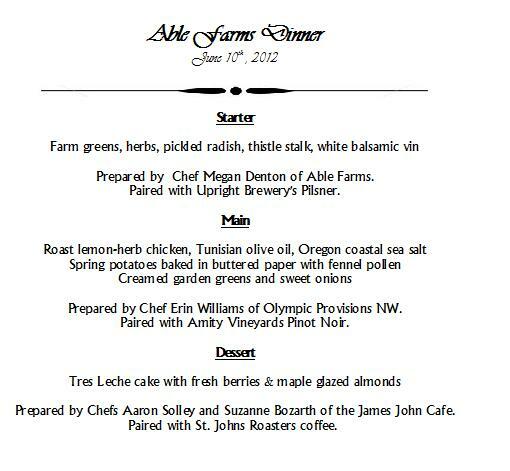 Able’s own Megan Denton will be helping to prepare dinner, along with Olympic Provisions NW’s Head Chef Erin Williams, and dessert by Chefs Aaron Solley and Suzanne Bozarth of the James John Café served with coffee from the St Johns Roasters. Click on the button below to purchase your tickets. We’ll send you an email confirmation when we receive your payment. Thanks!